the New York City Department of Transportation. While the outward goal of Harlem-based artist Meeker’s public art project is to honor the neighborhood in which he has lived and worked for the past 15 years, the massive sculpture will also stealthily teach its viewers about their relationship to light. We called up Meeker to find out more about the piece and his theory on the kinds of light that please the soul. The piece is pretty huge and it will be illuminated. From how far away will it be viewable? I’m hoping you can see it from New Jersey. It will definitely be viewable from Morningisde all the way over to 12th avenue and then from the tops of buildings and whatnot. You call it a “city-wide beacon.” Are you hoping the work will point people uptown? 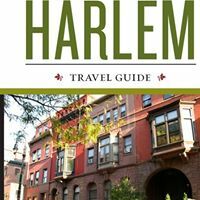 I’ve lived in Harlem since ’99 and it’s had such a profound impact on my adult life. You don’t hear of a lot of huge public works happening in Harlem. You see them happening downtown, but you don’t see anything happening in Harlem. You also work as a lighting designer. Do you see that label as separate from being an artist or are they the same? I’ve always viewed myself as an artist. The way that I’ve been able to do my art most effectively is through lighting design. Moving to this type of work has been a very natural process. Being a lighting designer, there’s a whole lot of capability that I have that I wouldn’t otherwise have. That allows me to really think in artistic terms not limited by what my technical limitations would be. How have you brought your lighting design expertise to this piece? As humans we have a relationship to light but the relationship to light that we have is really one of visibility more than sensibility. For the purposes of this conversation, let’s just assume that the soul is constructed of light. The body can function very well under all kinds of light, but the soul only connects to certain kinds of light. I believe the differentiating factor is that certain light has full spectrum and certain light does not have full spectrum. If you look at my past work you’ll see it’s all based on juxtaposing light sources. What that does, is it gives the viewer the ability to start to distinguish a relationship to light. I did this piece at the Whitney where we had five different life sources. I had them be immersive just allowing people to walk into the room. Everybody congregated in one spot. It was really interesting to see the way that people were attracted to certain kinds of light. Most people walked through all of the kinds of light and then ultimately went back to the one that had the full spectrum. It’s been very interesting to watch people and their relationship to light evolve in the presence of multiple sources and their ability to distinguish within that context. So how does all of that apply to the Harlem piece? With “The H in Harlem” there will be a juxtaposition of LEDs, which will be in the outer rim, and then the H itself is going to be lit up by plasma light. Plasma light is a relatively new technology. It’s a light bulb the size of a tick tack. It puts off twice the light of a streetlight. It puts off full spectrum light. What I wanted to do was juxtapose full spectrum light versus LEDs, which have incredibly small slivers of the spectrum, and then amplify them to create visibility but not create connectivity. The upshot in all of my work is to create a relationship between humanity and light. It goes beyond visibility. How do you hope people in the neighborhood receive the work? First of all, the initial idea was let me give back to the community that’s given me so much of my life. Then, I was like, “What are we really going to give here?” Are we just going to put up an H and give them an art piece? Or are we going to start to give people, whether consciously or unconsciously, the ability to start to evolve their relationship to light. It’s about providing sources of light to heighten the viewer’s relationship to light.